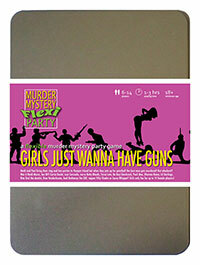 You've been invited to play the role of Andi Bothways in Girls Just Wanna Have Guns. Heidi and Paul are throwing their pre-wedding parties at luxury spa and adventure resort, Pamper Island. But after one too many drinks, the bride and her entourage are invited to 'hunt the stag' with paintball guns - and best man Steve Wingman meets a grisly end! Can you find out who murdered him? Grab your guns and get ready for a facial at the luxury spa and adventure resort of Pamper Island! Short hair, piercings, baggy jeans and shirt, you like to keep your body contours hidden and your gender a mystery - unless you’re wearing that skater dress you love, obviously. Growing up as the youngest of ten siblings you sometimes felt the most neglected of the bunch. Your brothers would be praised for one thing, and your sisters for something else. There’s nothing like hedging your bets when it comes to winning your parents’ affection, and you straddled the line so finely for so long that you decided to androgenize yourself. Boy, girl, what difference does it make…? Hi everyone, I’m your favourite guy or girl, Andi. Labels are so 20th Century, people need to YOLO, IMHO. So, anyway, I was in the woods when Steve got killed and I was like, that’s so shocking you’d die in your birthday suit, and I just wanted to cover him up. But it sounds like everyone had issues with that boy, so I’m glad I didn’t have to share a room with him or anything. I didn’t really see or hear anything when I was playing — those guns are so heavy when they’re filled with balls, aren’t they?